With his muscular front legs and big rear wheels, Ollie is a hit wherever he goes. The partially paralyzed dachshund uses a special cart to roll through his Palo Alto neighborhood with owners Sarah and Craig Stuppi. But that doesn't stop him from chasing squirrels, barking at dogs or sniffing bushes like any other dog. As soon as the Stuppis get out his leash in the morning, Ollie gets excited. Since he can't jump up and down, ``he kind of bobs until we get him into his cart,'' Stuppi said. The neighbors have gotten used to Ollie zooming down the sidewalk in his custom-made cart, which is known, of course, as Ollie's trolley, but many people seeing him for the first time can't resist asking about the little dachshund. 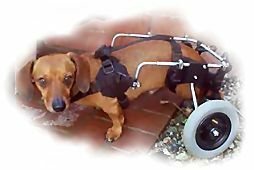 Like many dachshunds, with their short legs and long backs, Ollie was predisposed to throwing out a disc in his back. That he's still here is an animal rescue success. The Stuppis were living in Long Beach when they heard about Ollie. A friend of Sarah's saw him on the Beagles & Buddies Web site and showed his photo to her. On Feb. 14, Craig Stuppi told his wife that Ollie was his Valentine's Day gift. ``We brought Ollie and his trolley home, and he has been such a joy in our lives,'' Sarah Stuppi said. When Ollie isn't in his cart, he scoots around by dragging his rear legs. To help avoid abrasions, the Stuppis wrap his rear feet twice a week.